Last League Matches for HA1 and HA3. HA1 had a walkover on Tuesday as Loughborough 2 were unable to raise a team. With 12 match wins, 1 draw and a loss; they finish well clear of the field at the top of Division 2 and so next season will be back where they belong. HA3, on the otherhand, were soundly thrashed by the visiting Kirby Muxloe 2. Everybody had been looking solid enough for at least the first hour, before collapsing in the middlegame. This was the final position in my own effort. I resigned here with the black pieces as i could not see a way of stopping the white c-pawn from promoting. HA2 play their last league match tonight (Thursday 29th March). Next Tuesday there will be a club night at the Heathcote Arms - any new players welcome. Graham Sharpe (195) Current County Champion. People have until Friday 13th April to enter. Besides the County Championship, the Summer Cups and Club Nights, we should also have enough time for a Club Championship. We have not had one of these for a number of years - any ideas for a format would be greatly received. Well done everybody and good luck to HA2 tonight. HA3 Lose in the Last Round of the Minor. A one point handicap start for us owing to grading difference. Gary, and then Gordon, lost fairly early. Raymondov had two knights against a rook and bishop, but looked like he might pull off a draw. Not quite though. Haka Dave was last man standing. At this point, i mistakenly told him that the score was 2-2, when, in fact, Syston already had three points and therefore the match. Anyway, the news that he had to avoid losing - even if this had been built on a false prospectus, seemed to increase Dave's motivation. He simplified into a king and pawn endgame swapping off the last pair of rooks whilst giving him the opposition. It was then a matter of marching king and pawns up the board with only one or two of the moves being dodgy. HA1 were playing at Braunstone on Tuesday, too. Next Tuesday, 27th March, HA1 play at home to Loughborough 2, and HA3 play at home to Kirby 2. On Thursday, 29th, HA2 play away at Market Harborough. HA1 & HA3 Both Play at Home. I was too engrossed in trying to prevent my own loss to comment on the other games, but it seemed a straight forward win. I think i was the first to finish - and managed a win. Gary, Gordon, and Michael then followed with losses. John then won his game. It was down to Drew to win his game and draw the match. He looked good, too, with a Queen, Knight, and Four Pawns against a Queen and four pawns. Both players had passed pawns - Drew's in the Centre - Brian's on the Kingside. At this point, Drew brought his rook forward on the Queen side in order to take out the last remaining black pawn on that side. Having done this, he realised that black now had a passed pawn on the sixth rank and he could not get his rook back in time. oops. On the postive side, Drew outplayed his opponent for a couple of hours leading up to this, and more wins are bound to follow soon. On Tuesday 20th March, HA1 and HA3 both play Cup Matches. HA1 play away at Braunstone. HA1 then still have a sixth round to play next month and are in with a shout. HA3 play at home to Syston in the last round of the Minor. Lifting the silverware is still mathematically possible (we can still reach 8 matchpoints), but unlikely given the high goal differences of Braunstone 2 and Melton 1. A decent clubnight on Tuesday is likely, too. An epic battle ensued when Leicestershire met Derbyshire at Spondon on Saturday. Leicestershire needed a draw to qualify for the nationals and a win to become Midland Champions, but a win for Derbyshire would see them through to the nationals and Leicestershire eliminated. We fielded almost our strongest possible team, but Derbyshire turned up with a stronger than expected team which meant, with the exception of top board, there was very little in grade difference. First blood went to Derbyshire, Simon Gilmore and Richard Vann swapped all the major pieces very quickly and once Richard swapped his last knight off for Simon’s bishop it was a straight forward pawn ending for Simon to win- 1-0 Derby. At this point both Alfonso and Jim Miller were material down and losing but battling on valiantly (so in effect we were 5-3 down). 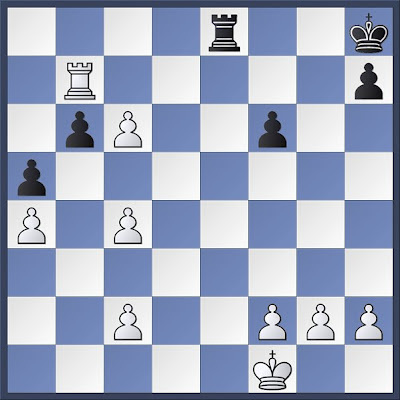 Chino and Sean Sheahan then completed nice wins; Chino gave up the exchange for extra pawns and positional advantage. 3-4 to Leicester. Mark and Patrick got their wins 5-7 Leicester. Martin then managed to force a perpetual check, an unexpected ½, Brian, who had been defending a pawn down, in Q,R+ opposite bishops, for most the game got the draw when his opponent decided to swap off the queen and rook, to an opposite coloured bishop ending and the draw was achieved. 6-8 Leicester nationals achieved. Alan Byron then lost to make the score 7-8, Andy Morley looking slightly better, then had his usual time scramble and came out of it 2 pawns down and a certain loss, with a hour of play left everybody else except Ray and myself went to the pub expecting us to following quickly with a drawn match, but Andy doesn’t give in and spent 20 of his extra 30mins on the next move, trying to find an answer to his lost position. This may have unnerved his opponent but after a couple of moves by Andy, his opponent had the opportunity to swop his queen and rook off for a won pawn ending but instead kept checking to try and get a bigger advantage and eventually used up a lot of his own time, with Andy 3mins against 5mins, his opponent played a couple more checks and offered the draw! 7½- 8½ to Leicestershire. We retired to pub to disbelief from all present. Our next match is ¼ final against Cambridgeshire, scheduled for May 19th, subject to confirmation.